Uninhabited, low-lying meadow land around the confluence of the Afon Clywedog and Afon Clwyd, with drainage dykes, embanked and canalised streams, with few roads. Falling along the boundary between the medieval ecclesiastical parishes of Llanynys and Llanrhaeadr-yng-nghinmeirch, and administratively along the boundary between the commote of Ceinmeirch in the cantref of Rhufoniog and the commote of Colion in the cantref of Dyffryn Clwyd. Flat, low-lying and poorly-drained meadow land in the centre of the vale, around the confluence of the Afon Clywedog and Afon Clwyd, between about 30-40m OD, with no modern settlement. The area has been extensively drained, but is still seasonally waterlogged. The major period of drainage is largely of post-medieval date, plans of 1780 showing the new line cut for the Afon Clwyd. Visible features designed to counteract the poor natural drainage include canalised streams, drainage dykes around field margins, open drains inside some fields, with embankments alongside Afon Clywedog and Afon Clwyd, though there is some evidence for quilleted meadows in the interfluve between the Afon Clywedog and Afon Clwyd during the medieval period. A mixture of small, medium and large rectilinear fields reached by trackways and footpaths, some in hollow-ways, running down from the higher ground. Area of strip-like fields bounded by drainage dykes to the north-east of Llanrhaeadr, some of the strips on the edge of the lower ground in this area, near Llwyn Mawr farm, with small areas of coppiced alder and ash woodland. 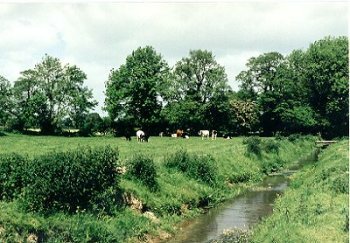 Often straggly and poorly maintained hawthorn hedges, with taller alders, poplars and willows strung out along the main watercourses. Small 19th-century? stone or brick barns at the corners of a number of fields, many now derelict. A number of long, low mounds in lower-lying and wetter areas are probably drying mounds, but are of uncertain date. This extensive poorly drained area towards the centre of the vale has been an obstacle to communication between the eastern and western sides of the valley, one of the few public roads crossing the area being Pont Drefechan, an early 19th-century stone bridge on the road between Pentre Llanrhaeadr and Llanynys. The embankment of the dismantled Corwen to Rhyl railway sweeps through the area, cutting numerous field boundaries, the pattern of which had evidently become fully established before the railway was built in the 1850s. The former Llanrhaeadr Railway Station lay on the road to the east of Pentre Llanrhaeadr.